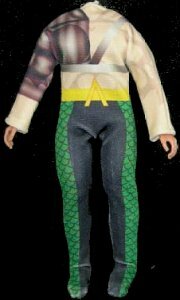 Custom Aquaman Suit for Mego Action Figures. This is the Peter David version of the Aquaman suit... yup, complete with flesh-colored top. Personally I would prefer the Neal Pozner blue camo suit, but this is pretty cool. You'll have to make your own harpoon, though.